St. John's wort (Hypericum perforatum) is an effective and relatively side effect free anti-depressant for some forms of light-to-moderate depressive disorders. It does interact adversely both with synthetic anti-depressants and with other drugs, so self-medication with St. John's wort is even less advisable than it is with other herbal remedies. Applied externally, an oil extract of St. John's wort flowers and leaves can soothe burns and support wound healing. There is also some evidence of the oil extract relieving muscle pains and inflamed joints. In fiction, St. John's wort placed on window sills and over doors keeps unfriendly Fae at bay and other monsters at bay. The European Medicines Agency states that the Committee on Herbal Medicinal Products (HMPC) is currently developing its findings on the herb, and lists a number of preliminary documents. 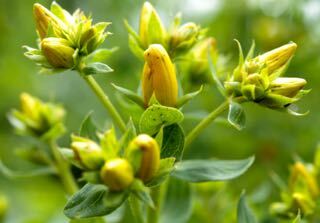 The European Scientific Cooperative on Phytotherapy has published a monograph on the effects of St. John's wort both for depression and as a remedy for skin problems. Cochrane reviewed 29 studies on the herb's effectiveness, and finds that the extracts tested in the studies were mostly superior to placebo. In the novel Fire Touched by Patricia Briggs', character Mercy Thompson uses St. John's wort essential oil to stop an attacking troll in its tracks. Witchipedia, an online encyclopedia of magick, folklore and the occult, recommends the plant's oil extract as an anointing oil for Midsummer rituals and exorcism. Other sources mention its usefulness against Swedish wood-wife spirits, fairies, diseases caused by the Elle-people, and fairies again.